I am a great admirer of Lada Vosejpková's work . I am fascinated by her jewels, these are more art of sculpture than art of design jewellery. Each of her jewel design is basically a small sculptore. 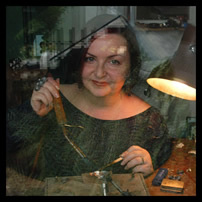 Lada Vosejpková is not only a succesful czech jewel designer, but also a leading pioneer in line of the miniature plastic art. I wish her a lot of ideas in next years. I hope that she will still give us, the lovers of art, a lot of pleasure in future.